Yup. You read that right- breakfast pie. The merits of pie as a breakfast food has long been a topic of conversation in my nearest and dearest friendship circle. All of us have agreed for years now that pie is definitely a legitimate breakfast food. I mean, think about it for a minute. Toast and jam is pretty much pie. Poptarts and toaster struddles, while a questionable choice for the first meal of the day, are technically considered a breakfast food. So, how come the rest of the world has never seemed to catch on to our obsession (legitimacy) of eating pie for breakfast? Come on, it really makes sense. Maybe we have all just convinced ourselves that pie was a good breakfast food because it made us feel better about the fact that we ate dessert for breakfast on multiple ocassions (don’t pretend you haven’t done it too). Now, I am happy to let my friends carry on and eat pie for breakfast. I really am. BUT, I also happen to be somewhat of a sugar policewoman when it comes to my own diet. And, we can’t really argue that eating a whole bunch of sugar first thing in the morning is probably not the best idea. Plus, I’m pretty sure that pie crust isn’t really much of…well, anything that is beneficial to our bodies. So while I don’t condone or question the merits of eating pie for breakfast (I mean, have you seen what is marketed out there as breakfast food…see above mentioned poptarts and the ingredients for my point) I have been thinking for a while now that I could probably come up with a way to make a pie for breakfast that is much more nutritious. Enter, breakfast pie. I’ll say it again. BREAKFAST. PIE. Summer is so obviously my favourite season here in Southwestern Ontario. It’s sunny, it’s warm, cottage country is lively and fresh locally grown produce is abundant. Oh baby, there is nothing like eating fresh Ontario strawberries in July. 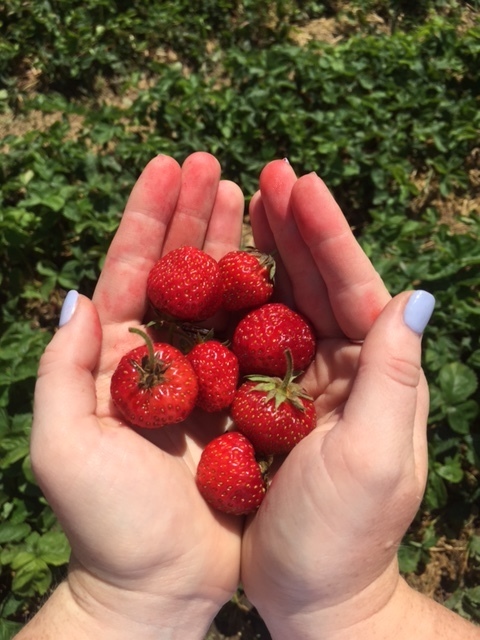 Last week hubs and I headed north of the city to pick some strawberries, and besides coming home with a fairly bad sunburn (how come I never learn?) we had a very successful day and ended up with like…4L of strawberries or something ridiculous like that. Immediately, I started thinking about what could be done with all of them. The possibilities are endless really, but with one of my pie-eating-for-breakfast friends’ birthdays coming up I realized now would be the perfect time to try and make a healthy breakfast pie. After washing and cutting (and eating) up our forage, I got to work. The result, if I do say so, was a success. 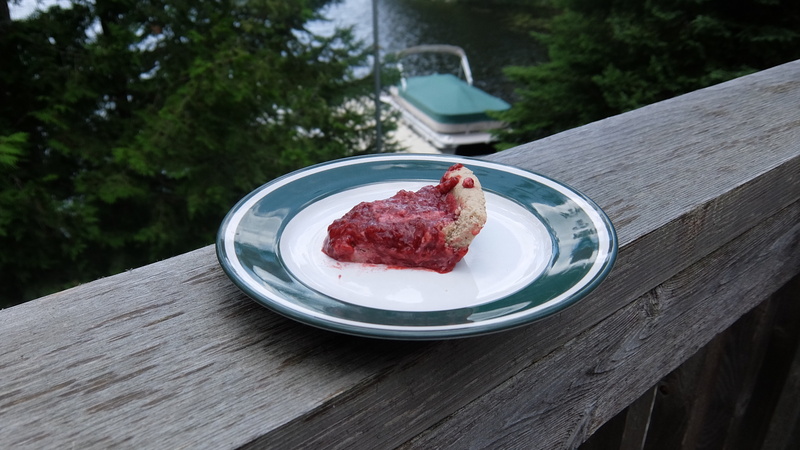 In fact, I only have a picture of one piece of pie because it was gobbled up at said friend’s cottage before I remembered I didn’t photograph it at all. I’m not kidding when I say this pie is healthy. The crust is full of protein and hearty oats. The filling is packed with strawberry goodness and chia. AND the whole thing only has a total of 5 tablespoons of maple syrup so it’s low in sugar and refined sugar free. OH, and it’s gluten free. OH, and it’s vegan. And did I mention it is pie that is acceptable to eat for breakfast? I also heard from a little bird that it tastes really good with some whipped cream (which could be swaped for some whipped up coconut cream to keep it healthy). This pie is based off of a crust recipe from My New Roots and the filling is adapted from this raspberry chia seed jam from Oh She Glows, so while I would like to take credit for this pie fully, as always, Sarah and Angela were recipe creator geniuses behind the elements of this pie. With that, here it is. Breakfast. Pie. In a bowl, mix oats and almonds with sea salt, coconut oil and maple syrup. The mixture should be thick but should stick together. Spread crust ingredients into a pie plate. Place the mixture in the middle and press down and outwards until it is evenly distributed. Poke the crust with a fork and then bake for about 12-14 minutes until golden brown. While crust is baking, combine all filling ingredients into a saucepan. Bring to a low boil and then reduce heat to medium-low. Allow the filling to simmer for about 15 minutes. Stir the filling frequently as the strawberries break down. The mixture should begin to thicken. Place filling in fridge overnight which will help to thicken. When ready to serve, pour filling into crust and enjoy. Could be warmed up but is amazing cool as well.